As for quick fix: open door and look at the back side of the sliding door (see attached pix). Find the latching mechanism: large rotating hook grabs vehicle post, screwdriver is pointing to small catch that acts as a ratchet to grab and hold the hook in place. (If you rotate the hook, it may latch. Operate the door handle to release.) Now - douse these parts with WD-40, rub with cloth to clean crud away. Repeat 4-5 times until parts move freely. You may need to use a small screwdriver to move parts. This will get door in working condition. 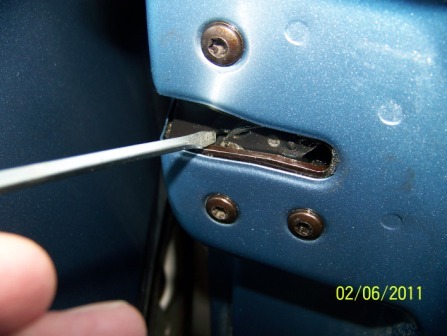 This is a common problem that can usually be remedied with some WD40 on some cases, bt if that is not helping then replace the lower latch and this will solve the problem. Or in some cases, the cable that operates the latch had come out of the door mechanism. This stops the door latching all of the time though. dirt gets into them causing them to malfunction. Sounds like WD40 is cleaning out the gunk so the latch works properly until dirt gets back into it. Labels: manually operated sliding door will not remain open on Chrysler Town n Country .